I'm pleased to introduce a powerful new cloud computing tool available in Ubuntu 11.10 (Oneiric), thanks to the hard work of my team (Brian Thomason, Juan Negron, and Marc Cluet), as well as our partners at VMWare -- the cloudfoundry-client package, ruby-vmc and it's command line interface, vmc. CloudFoundry is a PaaS (Platform as a Service) cloud solution, open sourced earlier this year by VMWare. Canonical's Systems Integration Team has been hard at work for several weeks now packaging both the client and server pieces of CloudFoundry for Ubuntu 11.10 (Oneiric). We're at a point now where we'd love to get some feedback from early adopting Oneiric users on the client piece. 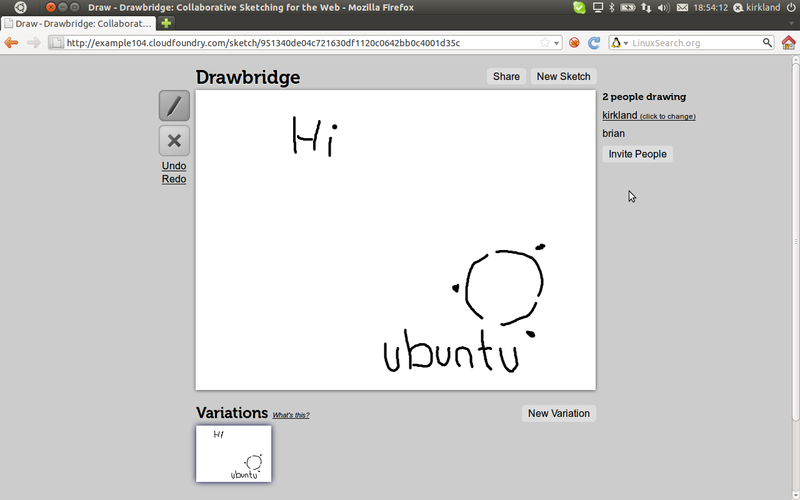 PaaS is a somewhat new area of Cloud Computing for Ubuntu. Most of our efforts up to this point have been focused on IaaS (Infrastructure as a Service) solutions, such as Eucalyptus and OpenStack. With IaaS, you (the end user of the service) run virtual machine instances of an OS (hopefully Ubuntu! ), and build your solutions on top of that infrastructure layer. With PaaS, you (the end user of the service) develop applications against a given software platform (within a few constraints), but you never actually touch the OS layer (the infrastructure). CloudFoundry is one of the more interesting open source PaaS offerings I've used lately, supporting several different platforms already (Ruby, NodeJS, Spring Java), and several backend databases (MySQL, MongoDB, Redis), and support for other languages/databases under rapid development. In the mean time, let's deploy a couple of basic apps to CloudFoundry.com! The tool you need is vmc, which is provided by the ruby-vmc package. We in the Canonical SI Team didn't find that package name very discoverable, so we created a meta package called cloudfoundry-client. First, you'll need to set the target server for the vmc command. For this tutorial, we'll use VMWare's public server at cloudfoundry.com. Very soon, you'll be able to target this at your locally deployed CloudFoundry server! Your friendly Canonical Systems Integration Team have developed and tested a series of simple hello-world applications in each of CloudFoundry's supported languages. Each of these applications simply print a welcome message, and display all of the environment variables available to the application. The latter bit (the environment variables) are important, as several of them, those starting with VCAP_*, serve as a sort of metadata service for your applications. Our sample apps are conveniently placed in /usr/share/doc/ruby-vmc/examples. And now, I can go to http://example101.cloudfoundry.com/ and see my application working. And now, I can go to http://example102.cloudfoundry.com/ and see my simple NodeJS application running. Now, we'll deploy our sample Java application. As with anything that involves Java, it's hardly as simple as our other examples :-) First we need to install the Java tool chain, and compile our jar file. I recommend you queue this one up and go brew yourself a gourmet pot of coffee. (You might even make it to Guatemala and back.) Also, note that we'll make a copy of this directory locally, because the maven build process needs to be able to write to the local directory. $ cp -r /usr/share/doc/ruby-vmc/examples/springjava . All that for a Java hello-world ;-) Anyway, I now have it up and running at http://example103.cloudfoundry.com/. Hopefully these hello-world style applications will help you get started quickly and effortlessly deploy your first CloudFoundry apps. But let's look at one more complicated example -- one that requires a database service! In digging around the web for some interesting NodeJS applications, I came across the Node Knockout programming competition. I found a few interesting apps, but had a lot of trouble tracking down the source for some of them. In any case, I really liked a shared-whiteboard application called Drawbridge, and I did find its source in github. So I branched the code, imported it to bzr and made a number of changes (with some awesome help from my boss, Zaid Al Hamami). I guess that's an important point to make here -- I've had to do some fairly intense surgery on pretty much every application I've ported to run in CloudFoundry, so please do understand that you'll very likely need to modify your code to port it to the CloudFoundry PaaS. In any case, let's deploy Drawbridge to CloudFoundry! Note that vmc provisioning and linked a new MySQL instance with the app! Now that I have a few apps and services running, I can take a look at what I have running using a few basic vmc commands. Done! Wow, that was easy! I hope this helps at least a few of you with an introduction to PaaS, CloudFoundry, and the CloudFoundry-Client (vmc) in Ubuntu. As I said above, stay tuned for a post coming soon about hosting your own CloudFoundry-Server on Ubuntu! Is there any tool in incubation for Micro cloud foundry too that we can chip in? Awesome work... Never mind my tweets... There are a few missing steps and the ruby hello word does not work on my test. I had a ton of these problems when I first started trying to decouple the CF install (i.e., for Chef cookbooks). However, the Node.js example works fine. 1) Not being a debian packaging expert; how in the hell did you get the install to work so fast? Every install I have seen to date compiles from source. 2) Depending on the answer to question 1; who is going to support the debian packaging for CF? My experience over the last few months is that it changes a lot and if this is a point in time package I am not sure it will work in a few weeks. All and all I am very excited to se someone pick up the ball and start creating packaging for CF. Where can I get the test applications that you have used?